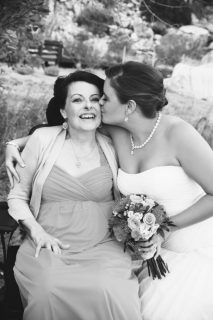 Kimberly had always dreamed of beautiful destination “I dos” on the beach, but when her mom was diagnosed with ALS—a terminal neurodegenerative disease—in October of 2013, her only wish was that her mom would make it to her wedding one day. At the time, she hadn’t even met her now-husband Cris, and wondered if her mother would be there when her big day finally came around. My mom is confined to an electric wheelchair and her ability to travel is severely limited, so I knew that I had to find a place that was wheelchair accessible. My long dreams of a beach wedding in Mexico were out the window. However, I was determined to remain positive because the most important thing was that my mom was going to get to see me get married; and that was worth more than any beach wedding. 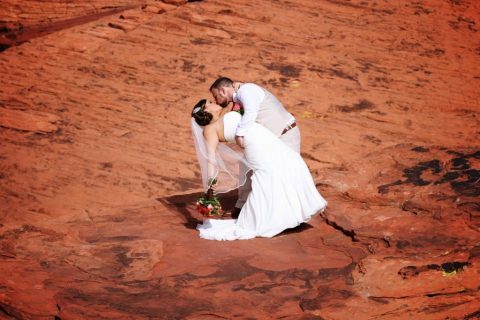 I still wanted a destination wedding, with a dramatic, beautiful landscape—I wanted it to be “epic.” I have travelled to 37 countries and without a doubt, one of the most beautiful places I have seen on earth is the Southwest in the United States. 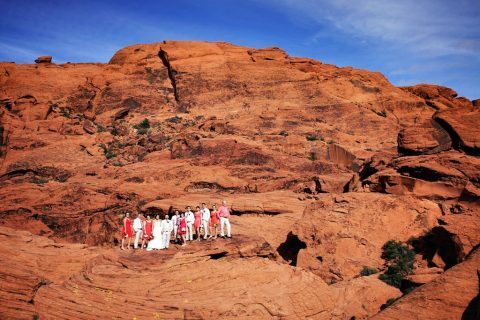 I took a road trip with a friend through the Southwest the spring before I got engaged, and I realized that this gorgeous red desert landscape I had grown to love would be a perfect place for our destination wedding. We chose Red Rock Canyon, outside of Las Vegas, due to its striking landscape full of contrasts. 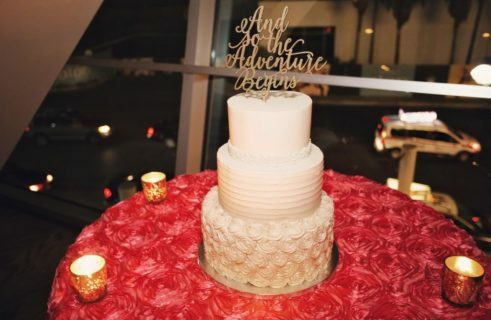 We are both avid adventurers and hikers, and frequently travel internationally to hard-to-reach destinations, and I wanted our wedding to reflect those elements of our life. In addition, Calico Basin, which was within Red Rock Canyon, had a wheelchair accessible platform! Perfect. I was sold, and booked the venue without ever having seen it in person a few days after we were engaged. Cris proposed to me on my 30th birthday, at our college alma mater, the University of Washington. While we didn’t meet here (we met online), the University of Washington holds a special place in both of our hearts. I absolutely love the campus and it’s one of my favorite places in Seattle! He blindfolded me and drove me around the city. Before he removed the blindfold, I thought for sure we were downtown—but boy was I wrong! When he removed the blindfold, I realized we were on campus. It was the absolute perfect location. Cris studied nursing at UW, and I studied Law and Women’s Studies. The campus is divided into upper campus and south campus, with all science and medical departments residing on the south campus. He picked a location that is between both locations to symbolize us as individuals coming together as one. I couldn’t have imagined a better proposal. The thought he put into it was heartwarming, and I loved the symbolism. We eventually had our engagement photos taken on campus. Now, it will always be an even more special place for us! This passage has provided me with great strength when thinking of the impending loss of my mom, and I knew it would give me strength and solace on my wedding day. 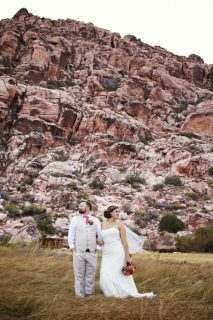 My bouquet was filled with desert plants like succulents and coral colored flowers that complimented the landscape around us. One of my favorite moments of the day was our continual amazement of the geography around us at every turn as our group moved through the Scenic Loop in the park. We all oooh-ed and ahh-ed, and being an avid photographer myself, I wanted to stop at every turn to take my own photographs, which made me very excited to see how our photos would turn out! My vision and hope for the canyon was exactly as I had imagined. The ceremony and photo shoot locations were challenging to get to, but the end result was worth it, and I felt like it represented our relationship and important elements of us perfectly. 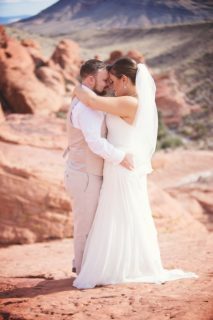 Our photographer selected three distinct locations for our shoot based on my preferences: an area with deep red sandstone formations that the park is famous for, alongside the road that winds through the park nestled between rock formations, and finally, in the grassy canyon in Calico Basin. I think she chose perfect locations that all produced varied and dramatic results. She was an absolute dream to work with. She ran with my OCD, overly planning personality and delivered on what I wanted. I highly recommend her! One of my best friends, who played the role of a bridesman and officiant, who happens to be British and gay, officiated our ceremony for us. 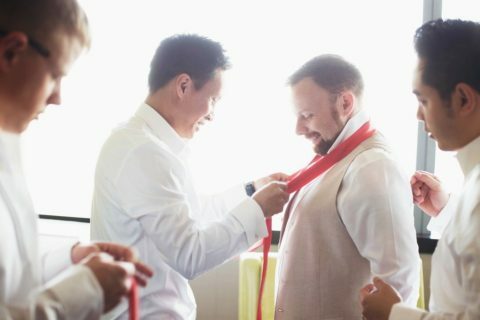 It was important to me that someone special and close to us performed the ceremony. 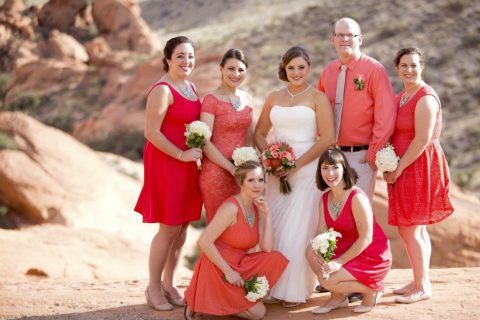 I had Colin wear a coral shirt to reflect that he was a member of the bridal party, while still standing out and looking distinct. 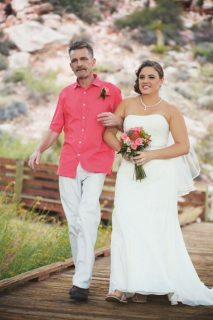 On our wedding day, there happened to be incredible wind gusts and my veil even flew off into the canyon. It made everyone laugh because we were all trying to hold everything down so it didn’t blow away! One of the DIYs I made was our seating chart, which was a world map that said: “Where in the World are you sitting?” International destinations Cris and I have travelled to together, as well as our honeymoon destination (Bora Bora), served as table numbers. The table markers were photos I had taken, with a LOVE directional arrow overlaid on the images. I also made a photo book that served as our guest book. The title was “Our Adventure Begins,” and it featured love adventure quotes on each page. 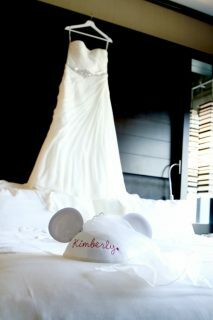 Because it was a destination wedding, we gave all of our guests welcome bags upon arrival in their hotel rooms. While it was a very significant cost, I am so glad we did this! It helped set the tone for the weekend, and the bags included mini bottles of alcohol, cans of Coke and Red Bull, snacks, and Vegas emergency supplies like Advil, Rolaids, Alka Seltzer, Kleenex, hand sanitizer, gum, mints, and Band-Aids. There was also a welcome letter that provided guests with all of the information they needed for the weekend and the wedding, and items that the Vegas Visitors Bureau sent me for free, including Las Vegas mints, pens, postcards, and informational brochures and maps. Putting these bags together was one of the most fun things for me in the entire planning process. It was so worth it when it was clear how much people enjoyed the bags! My advice to brides planning their own weddings would be to think about who you and your partner are as a couple and as individuals, and create something that represents you both that you will be comfortable with. 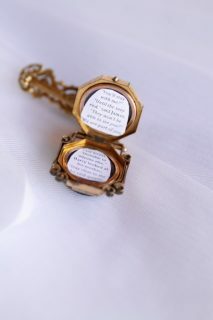 It will come through in the wedding and later in the photos! Prioritize the things that are important, and get rid of those that are not. It will help immensely with budgeting! 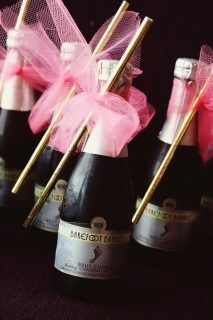 Focus on creating an event that you would like to be at, and make everything easy for your guests. 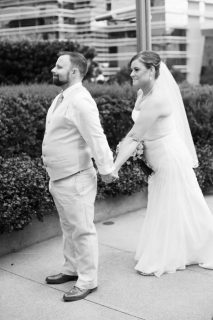 One of our guests wrote in our guest book that, “This was the best wedding I have ever attended, hands down!! 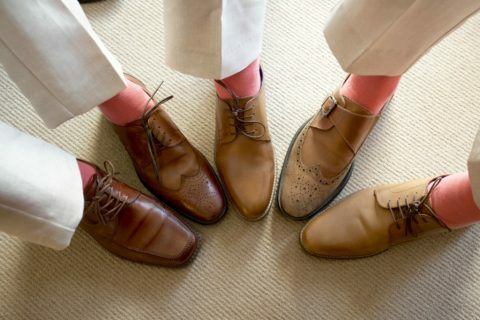 !” It was one of the best compliments we could have received.